I recently acquired a New Holland 1012 from a friend. 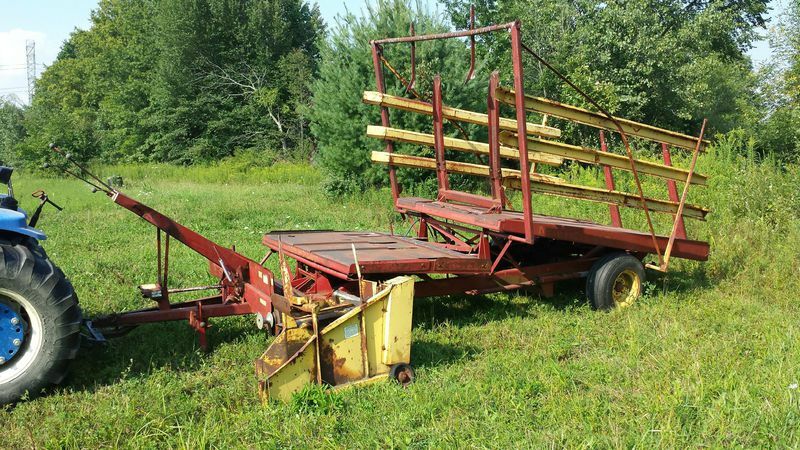 He said he didnt know what was wrong with it and I could try it out to see if it would work for me to use on the farm because picking up hay by hand gets a little old. Excited I went to pick it up and bring it home. First chance I got I hooked it up to the tractor to see if it worked. Some of the control handles were bent so I had to straighten those and of course one tire is completely flat from sitting. Then I get the PTO running and nothing is really working. The NH 1012 Bale wagon has a self contained hydraulic system so I decided to check the fluid level and it was pretty low. After adding some hydraulic fluid to the unit some of the controls started to work. However the first table was not mooving at all. Looking at it I discovered that there was a piece missing that controlled the first table and kept playing with the second and thrid table. While playing around with the machine, a hydraulic line ruptured and basically ended my testing. After talking to my friend he remembered that he still had that piece and brought it to me. After a new Hyd line and installing that piece and a spring I started her up again. Victory, the first table went up, but in the same breath there was also defeat as the first table stayed in the up position. And its resting place should be down until full then go up. Longer story short I found that the Prawl or clutch to the first table broke a keyway and had turned 180 degree out and was plain stuck. I attempted to beat it off the shaft, I attempted to use a 20 ton press but found that it is completely locked onto the shaft. So now I have a project machine. I have a few ideas on getting this thing to work but as of right now they are just ideas and I will need to purchase and fabricate some things. Keep watching the site as I work on the 1012 to try to get some life back into it and my arms during hay season.